"Going back... to our maritime roots"
NAVIGATOR Forum is being held annually since 2001 and always aims at reviewing, examining and discussing critical issues faced by today’s maritime community, on the insight of experienced speakers, including widely-known and successful Ship-Owners, foreign Ambassadors and Shipping Specialists. Aiming at enhancement and continuation of the Greek Shipping history, the last five years, we annually honor Greek islands & places which have contributed to the development of Greek Shipping like Oinousses, Hydra, Lesvos, Chios and Pireaus. In addition, the 17th NAVIGATOR Forum 2017, where you honored us with your participation, took place at SS HELLAS LIBERTY - in Piraeus with the participation of 700 Decision Makers of the Greek Maritime Community. 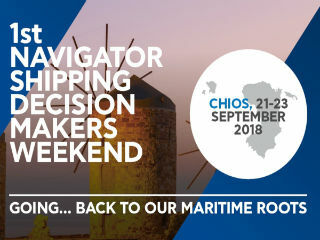 This year NAVIGATOR – The Shipping Decision Makers Weekend “is going . . back to the Greek maritime roots” by taking place in Chios, the island that is the birthplace of many shipowners, executives and seafarers. With the support of Maritime Organizations, our sponsors’ contribution, the support of the entire Maritime Press and the experience of accredited speakers, the "18th NAVIGATOR 2018 - The Shipping Decision Makers Forum” this year aims to stress the importance of Logistics, Technology & Innovation, Imo Regulations, Environmental Regulations, Education and maritime trends. Participation in NAVIGATOR FORUM, Chian Feast, Chios Mastic Museum, Mastic Villages and the transport to and from these events will be free of charge for all delegates. Please contact us (E: [email protected] or tel: +30 210 6234000) in order to book your ferry & air tickets as well as your accommodation at Chios Chandris Hotel where we have secured special rates (sinlge room Euro 85/ double room Euro 94).